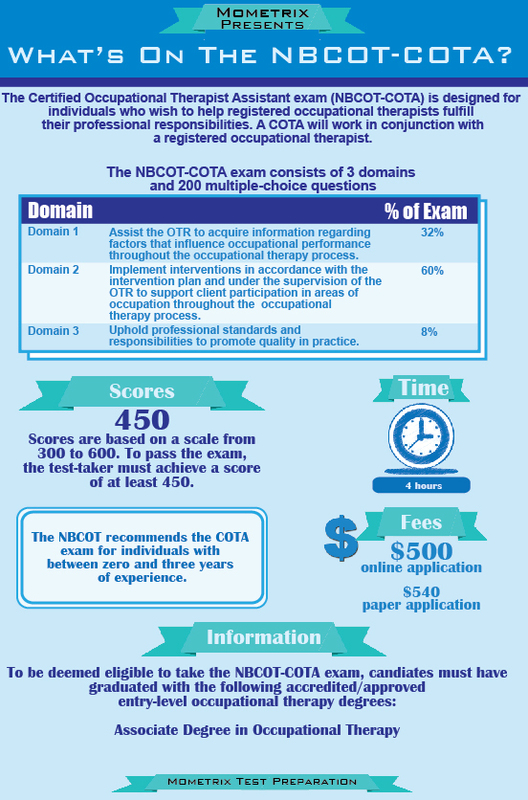 The National Board for Certification in Occupational Therapy, Inc. (NBCOT) offers the Certified Occupational Therapy Assistant (NBCOT-COTA) examination for certification purposes. Before a candidate can take this test, he or she must have successfully completed an accredited academic program for occupational therapy, finished the necessary experience obligations, turned in an application and gotten the go-ahead from NBCOT for the test, provided documentation from a school registrar regarding the candidate’s eligibility and signed the code of conduct. 1. Which of the following is an appropriate assessment for stereognosis? 2. A COTA is conducting a functional assessment of range of motion (ROM). Which of the following is NOT part of the functional assessment of ROM of the hip? 3. A client must wear a wrist-immobilization splint, but the splint tends to migrate as the client moves her fingers and elbow. Which of the following initial measures is indicated to reduce friction force and migration? 5. A COTA is helping to determine the best method to reduce panic attacks, based on best evidence. After posing the clinical question, which is the next step in evidence-based practice? 1. C: Assessment for stereognosis includes covering the client’s eyes and asking him to identify items using only the sense of touch. Clients should be able to identify an item within five seconds. The COTA should note the amount of time it takes the client to identify an item and whether or not he names the item properly. Items used for the assessment should be common items found within a client’s home, such as coins, cards, eyeglasses, eating utensil, keys, and pencils. During the intervention, the client first looks at and feels the object, and then he tries to identify it with his eyes covered. Hip: Flexion and extension, abduction and adduction, internal and external rotation. Shoulder: Flexion and extension, internal and external rotation, abduction and adduction, horizontal abduction and horizontal adduction. Wrist: Flexion and extension, radial and ulnar deviation. Foot/ankle: dorsiflexion and plantarflexion, inversion and eversion. Hand/fingers: Flexion (MCP, PIP, DIP), extension (MCP, PIP, DIP), abduction, and adduction (MCP). Thumb: Flexion and extension, opposition, abduction, and adduction. 3. B: Some migration is normal with movement because of the friction force between the skin and the splint. Often, covering the skin with a stockinet or elastic tubular bandage (such as TubigripTM) will be sufficient to reduce the friction force that results in movement (kinetic friction). Friction force relates to both the coefficient of fiction (depending on the material) and contact force (the degree of securing and tightening). The friction coefficient of a splint may be increased by lining the splint with foam or applying additional straps, which increases the force of the contact. Canadian model of occupational performance: Explores aspects of the person, occupation, and the environment. Sensory integration model: Explores sensory organization. Occupational adaptation model: Explores the process rather than focusing on particular skills. 5. A: Evidence-based practice begins by (1) posing a question to which there is an answer, (2) conducting a review of literature and clinical assessments to gather evidence, (3) evaluating both the usefulness and validity of evidence derived from literature review and clinical assessments, (4) summarizing and synthesizing results, (5) communicating with all those involved, (6) utilizing findings to change practice, and (7) monitoring the results of the new practices to determine if they need to be modified in some way and evaluating overall effectiveness. 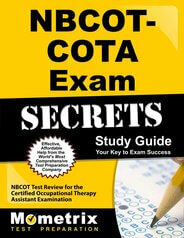 Ace the NBCOT-COTA test using our NBCOT-COTA exam study guide with practice questions. 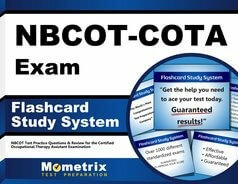 Quickly Solve Difficult NBCOT-COTA Test Questions with the NBCOT-COTA Flashcard Study System.